Panta bhaat or pakhala bhaat is a fermented rice porridge that is eaten after fermenting the rice for about 8 hours minimum. The farmers find vigour from such foods even if the ingredients are frugal. An occasional fish fry or green vegetables can be added to a poor farmers summer meal of panta bhaat, but the green chilly and onion would be a permanent companion to this meal. Urban folk eat this panta bhaat for a light cooling meal, I say it is therapeutic for the system as well. Cleansing type, detox food especially when had with raw onion and green chilies and some lime juice along with it. This past summer I tried a few variations of panta bhaat to improve my gut flora and to keep my self cooler and these meals helped a lot. I found this meal to be a real treat when accompanied with a fired eggs, some cucumber and some light vegetable curry along. Here you see a ridge gourd and poppy seeds curry called jhinge posto, another Bengali specialty. To make panta bhat just cook rice normally as you do. Add water to the cooked (or even leftover) rice, mix well to make all rice grains separated (to allow uniform fermentation) and let it sit for at least 8 hours in Indian summers. You should get a pleasant sourish alcoholic aroma when the mixture ferments nicely. Any foul smell means the rice has putrefied and needs to be trashed. Once fermented, you can refrigerate the panta bhaat for a couple of days if you made it in excess or let it become a bit more sour as per your liking. Garnish the fermented gruel with some chopped green chilly, raw baby onion and a little raw mustard oil (or extra virgin olive oil or toasted sesame oil), season with salt and have it with whatever accompaniments you like. You wont find much online information if you search for such forgotten foods. Healing foods were a part of every household and parents and grandparents intuitively knew when to prepare such a meal for an ailing family member or when the season demands such meals for the whole family. Some fun accompaniments were served with such frugal meals so the interest in the healing meal is not lost. Interestingly I found that raw onions of the baby variety were a constant accompaniment with this gruel in all Indian states that I got to know, some green chilly also enhanced the probiotic and cooling property. Some kind of fried fritters and fish is also served to keep the interest in such a simple frugal meal going. This article by Ena Desai throws some light on the 'culture' of panta bhaat. What flavors are added to this frugal meal and how some folks eat it with added jaggery too. I found a few recipes of Odiya origin called Pakhala and Konkani origin called Tanni anna , so glad a few bloggers are sharing traditional family recipes for the world. Vikram Doctor had done an article in Economic Times long back on this forgotten culture of food. The culture of food involved live cultures that heal the tummy and keep the gut flora healthy, cooling the body all at the same time. The phytic acid (the anti nutrient responsible for non absorption of minerals present in the food) is denatured during fermentation process , making this fermented rice meal many times more nourishing than plain boiled rice. See the research by the team of Assam Agricultural University regarding panta bhaat being a nourishing food.. I am surprised I have so many Bong friends and no one actually fed me panta bhat ever. They keep raving about it but never ever serve it to guests, the reason being, it is a very frugal meal and is considered lowly for the purpose of entertaining a guest. I wish panta bhat becomes a part of an elaborate menu somewhere. I would love to taste the authentic version some day. Till then I am glad I can ferment at home. Yeast is my best friend. As it is usually hot & humid throughout the year,curd rice is a staple breakfast in Udupi region incl Mangalore in Karnataka.Left over rice is kept covered under water in the night.Morning ,it is mixed with curds & a little salt & consumed.Sometimes,accompanied by achar. We have something called Kanji in kerala which is basically cooked rice with its water. Every time we used to fall sick my mom would make this and a dash of pickle, would soothe any palate made bland with antibiotics. But it is also considered a frugal food so not made usually. I am craving for it right now! Fermented food is good for digestion. I will give this recipe a try for sure. Lovely fermented rice! I would love to try it too! If you are close to Bengal culture and history, you would come to know that there is nothing glorified about serving panta bhat. Bengal has seen years of famine and refugee problems, when people has nothing left to eat except panta bhat and some roots. If you love bengali films, watch Mrinal Sen's and Ritwik Ghatak's films who ahs portrayed famine in such a realistic way that it is hard to assimilate. So in short, no mother would dare to serve her child "panta bhat". Please do not glorify it. Dear friend, you are my namesake and I am not too happy with it right now. Why do you align value to a food judging it by it's ease of making or the cost involved? Pleas Grow up and respect food in all it's glory. As Indians we are taught to respect 'anna' and we worship Ma Annapurna even if we move back in history from the famine of Bengal. What does that comment even mean? How is showing a cuisine that is healthy and beneficial to your system brought down to famine and refugee problems? I think you've mixed up your issues Sangeeta (and not healthfood desi videshi), you're glorifying it by making it into such a big deal. By your logic no one should ever talk about eating with bajra or jowar because according to you (in this case) only the "poor will eat it". Or that ragi, should not be even touched because only the labourers eat it down south. So, if panta bhat was eaten during the times of famine, does that mean you "glorify" it by never daring to serve it or talk about it?!! In my opinion panta bhat should be glorified and should be worshiped even more because it helped an entire generation survive a famine in the history. How can Panta or Poita bhaat a food of famine .? Basically this food is to beat the heat . I love this dish and so my friends and family members . Pakhala is a delicacy in Odia culture. And though even the poorest of poor do eat it, it does have glorified presence too. In Odia culture often the first food the damad of the family is served soon after the night of the wedding is Dahi pakhala. Odias across the world do celebrate 20th of March as the Pakhala Day. Eating pakhala is celebrated in other festivals such as Raja too. In fact, the Jagannath Maha Prasad if left over is fermented and eaten in most families as Abaddha pakhala... Odias living outside Odisha do have their pakhala parties and serve pakhala to fellow Odias. We have tried serving it to non-Odias and even non-Indians. One reason why I wouldn't serve pakhala at a party where there are people who have never tried pakhala is because they find it difficult to eat watery rice with their hands and pakhala never tastes the same with a spoon. Another reason is because like French cuisine, one needs to be slowly introduced to other Odia cuisines before really liking pakhala. You need to first develop the taste. 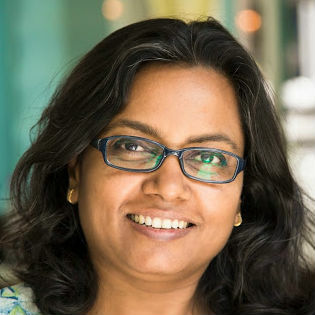 Thanks Dr. Nandita for the valuable inputs. Yes Ritu, those gulgule are made often with leftover atta that many people trash. Sourdough is alien to many. Well, food may bring some sad memories but then at the end its all about moving on!. I remember when I was a kid I used to see some religious jai santoshi maa!..where protagonist (daughter in law) use to ask her in laws like give me bajre ka roti and so on!.. and now I m married in marwari family where i eat it like no man business...and i always joke around it!!... SO, i think with food we should leave our prejudices and move on... we have enough of other things to deal with!.. And Ritu, in my mum's house- fermented atta was used to make pooris and gul gulle too!...:)! they r just so yumm!. Never thought you would respond so promptly. You misunderstood it and so does other readers. I am not judging the food by its ease of preparation or cost involved. I have grudge against those who glorify "panta bhat" as exotic ! Have you seen small hungry kids surviving on panta bhat for months, a meagre morsel of rice and water, always hungry, always teary eyes, always hoping that today they will get to eat something other than this. Will you have the heart to serve those hungry kids, glorified paltter of panta bhat and telling them its nutritional values ? They are forced to eat it out of circumstances. They are not enjoying the food. They cannot afford some good food. You can enjoy panta bhat once or twice, but can you survive on this ? Celebrating food is diiferent than surviving on it. You as food blogger can blog about it, glorify it, tomorrow it will become exotic, will fetch dollars from top restaurants around the world, but the fate of hundreds of poor hungry kids who survive on this will not change. Irony ? You may have your point of view, so do I. Little bit of conscience and sensitivy can make this post more readable. Dear friend, I would still choose to glorify this food. I would want the poor kids to feel good about their food which they CAN afford. All of us should feel grateful to the food (anna) we CAN afford and should stop pitying the poor. Pity is an emotion that comes when we perceive them as others, I would like to empathise with those who cannot afford nourishing food, FYI panta bhaat has sustained farmers to do hard work in the fields so IT IS NOURISHING food. And please understand that I am not glorifying poverty here. Just the food. And I would be glad when this panta bhaat would be served in high end restaurants, may be then people like you would feel better about the poor eating panta bhaat. Please don't question my conscience and sensitivity, cultivate some for yourself first. Did I READ......conscience and sensitivity Sangeeta Sengupta? what a beautiful response. "Pity is an emotion that comes when we perceive them as others" - exactly. Oh ! when panta bhat will be declared as National Food and glorified from Government of India. I shall be happy then. Excellent praise for a country food described as 'ANNA' comes from Annapurna MATA. Great answer. First off, I was not aware of the probiotic effects of this, so this just made me a bigger fan of panta bhat. Four or five years back, when I began experimenting with a minimal kitchen, this used to be a frequent meal, primarily since I did not have a fridge to keep leftovers in. It is a perfect foil for harsh summers and some variant of it can be found in most hot climes. I live in Hyderabad, and here it is called ganji (I think). The absence of other ingredients also makes it an ideal dish for those pursuing activities that require a clear body and mind. The weak alcohol it produces in the belly after a meal is also quite a delightful feeling. It deserves to be glorified, just as much as spuds. Thank you Subhorup. Panta bhaat needs to be revived for those it was dead. I never had it in my family being grown up mostly in North India but I found panta bhat incredibly satisfying. I am sadden to see such limited knowledge of my BENGALI friend. I am a Bengali . I would like to put some facts here, Among Hindu Bengalis, it is consumed as Prasad on Sasthi Pujo which falls on the day next to Basant Panchami. Panta is also served at high-end eateries in Bangladesh and West Bengal. I have had it in Bangladesh High Comm here in India on the occasion of their National Day Celebration. Criticism always helps in improvement but must be logical and genuine . I have tasted that Got sheddo prepared for Sashthi pujo but never had a chance to have panta bhaat with it Tapati. I wish I tasted that bhog. Thank You for this recipe . It brought back many memories of my father telling me how his Mom would serve this highly nutritious gruel to her brood of ten kids and how fueled and energetic he would feel throughout the day . I am happy you brought it to the forefront and gave it all the dignity and grace it deserved . And know what ? Even though I serve hot breakfast to my maid , she prefers her "chaddi Annam" or "panti bhat' as you call it. She has it with chilly and sour buttermilk . I am glad I could evoke good memories for you Sri. Thanks for the lovely comment. 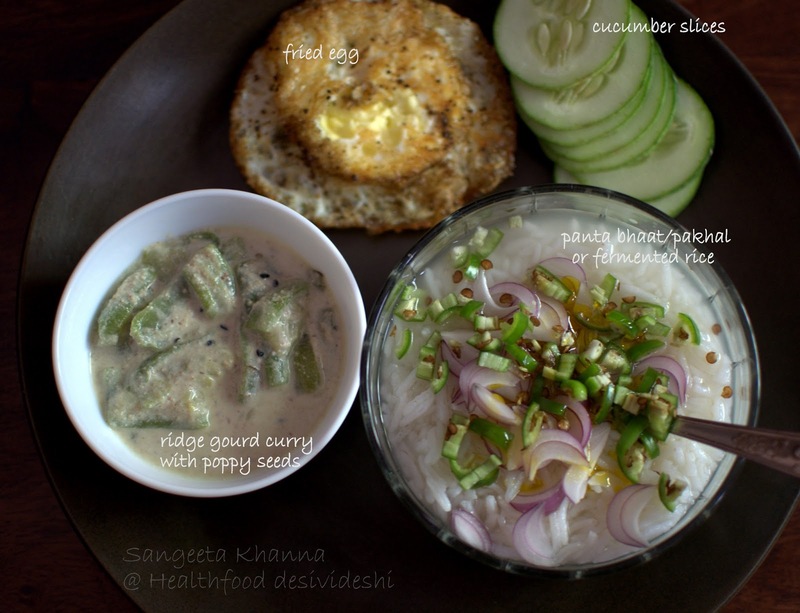 Hi Sangeeta ( of healthfood deshi videshi fame :) ) ... First of all, nice work on sharing the recipe for Paanta / Pakhala bhaat! Amazing comfort food for 'most' people from the region. I happen to mention 'most' given the misconstrued perceptions attached by some having a discussion in this forum. As a self confessed foodie, I can happily agree with you that while the dish may have had humble origins, and under whatever circumstances, no doubt it has still provided nutrition and sustenance to many! Such is the versatility of food from humble beginnings, its as good as relishing a plain plate of dal rice, even if one has been enjoying say hotel food during tours / travels etc! And why shouldn't food from any background deserve its rightful spot under the limelight? - A hungry bengali for Paanta Bhaat! Thank you my friend. The spirit of food should not be discriminatory I agree. All food is divine no matter where it comes from or whose plate it adorns. I'd guess the fermentation takes place at room temperature, i.e., ~ 30 - 32C in Indian homes. What if it was left in the refrigerator or air conditioned kitchen ...~ 23C? Would rice still ferment? How long can the fermented rice be kept as 'left over' in the refrigerator? Thank you. around 23 C there shouldn't be a problem fermenting the rice gruel. It would just take a bit more time, you would see the bubbles and a pleasant alcoholic smell as well. Ohhh cant resist myself ..coz I love panta bhat .. lots of way to eat..
Today am going to eat in my style. .
Panta bhaat ..onion green chilli lil mustard oil.. alu bharta .. posto bata (poppy seeds).. I love panta.. but style of eating is various. . I like panta with lil mustard oil..onion.. green chilli. .fried fish / shrimp bharta.. aloo bharta.. dal pakoda.. and surely with posto bata (poppy seeds).. yum.. am going to eat today cant resist lol..
Sangeeta off late i did not find panta bhaat as tasty as say when i was a child. Though i added things like fragrant lemon leaves and sattu and crispy aluu bhaaja. A farmer's wife whom i met in a local train helped me analyse the problem. It is probably the polishing the rice undergoes. She said they do not have it much because of this reason. But I have tasted panta made with sheddo bhaat and that would be a cultivated taste for me, may be gondhoraj lebu will make it tastier. I value panta bhaat more for the nutritive value than the taste though. Sangeeta you absolutely must have gondhoraaj lebu from my garden. You know I usually have a lot of lemons in july august and since they lose their fragrance when they turn yellow have to give them away. If you need the rind for baking (or any other thing ) you can tell me. I feel very guilty wasting it. I will personally preserve it as per your instructions. My garden is small but not my heart. I will see to it that you have them sooner than later. BTW even adding the leaves help as they are so fragrant. My neighbour adds them to tetor daal( daal with bitters) and I sometimes add them to Jol bhaat (a milder form of panta bhaat). Would you like a sapling. With enough water and a secret ingredient I see no reason why it should not grow in our national capital. Have you ever taken a train ride to Kolkata from Dhanbad. If yes, have you had the masala, lemon tea that is so popular and so yummy. It is a all time favourite and I was kind of banking on you to come up with a home made version. Thank you for being extra,extra nice. Hi. Its monsoon now. I vaguely remember reading smwhere that fermented food should be avoided during rains. Is this true? If yes then Can this and other fermented food be eaten after rains pass ...during autumn? Yes fermented foods get contaminated easily during monsoons so we generally avoid the in India, at least in the parts of the country where it rains for the whole of this season. We resort to spicier freshly made foods during monsoons. Yes panta bhat can be had after the monsoons. Please tell me how to make the potato sabzi that you have for panta bgat.